Two student-athletes from McGill are among the CIS Top Eight Academic All-Canadians for the 2013-14 season announced Tuesday by Canadian Interuniversity Sport. 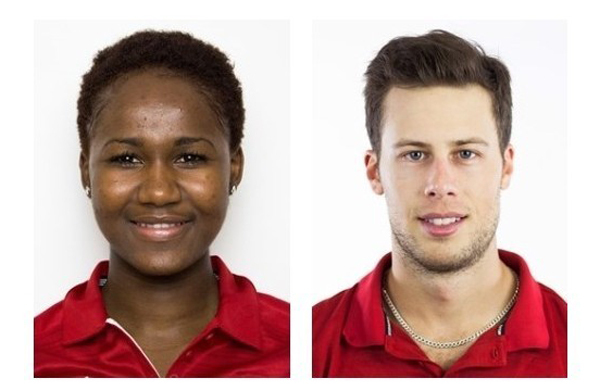 Representing the Réseau du sport étudiant du Québec conference are McGill standouts Mariam Sylla, a basketball player and pharmacology student, as well as Cédric McNicoll, a hockey player and accounting major. Basketball’s Mariam Sylla (left) and hockey’s Cedric McNicoll (right). The elite group will be honoured at Rideau Hall in Ottawa later on Nov. 17. Every year, a growing number of CIS student-athletes are recognized as Academic All-Canadians, having maintained an average of 80 per cent or better over the academic year while competing for one – or more – of their university’s varsity teams. In 2013-14, a record 2,863 students achieved the prestigious status, eclipsing the previous mark of 2,695 set a year ago. Five of the largest CIS member universities had over 100 Academic All-Canadians last year, including Western (140), Alberta (123), Waterloo (120), Laval (115) and Queen’s (111). Rounding out the national top 10 were Toronto (99), Acadia (95), Calgary (91), McGill (90) and UNB (90). McGill leads all universities with 20 honorees since the CIS Top Eight award was initiated in 1993. Rounding out the top producing institutions is Alberta with 12, followed by Manitoba (12), Dalhousie (11), UBC (10), Laval (9), Montreal (7), UNB (7) and Toronto (7). Joining Sylla and McNicoll among the 2013-14 recipients are AUS honorees Michelle Pryde, a soccer player and chemistry major from Acadia, and Adrian Robertson, a hockey player and business administration student from UNB. The OUA winners are Western’s Caroline Ehrhardt, a track and field athlete and health sciences student, as well as Carleton’s Tyson Hinz, a basketball player and commerce student. Last but not least, the CWUAA recipients from Canada West are Manitoba volleyball player Brittany Habing, a science student, and Alberta basketball player Jordan Baker, who is currently working towards his master’s degree in coaching. Sylla, a native of Conakry, the capital city of Guinea, has been nothing short of phenomenal in her first two seasons with the McGill women’s basketball program. After being voted CIS rookie of the year in 2012-13, the 6-foot-1 centre was named MVP of the RSEQ conference and a first-team all-Canadian in her sophomore campaign thanks to her Quebec-leading 9.4 rebounds per game and her 13.1 points per contest, good for second in the league. She has led the Martlets to back-to-back RSEQ titles and a pair of CIS championship appearances. A co-captain of the Martlets, Sylla helps to coordinate the team’s annual wheelchair basketball game with the Montreal Action Centre as part of the “Chaire Aware” campaign to promote awareness about those with physical disabilities. She will be participating for the third straight year in the Varsity Council’s annual Christmas food drive and is also coordinating the team’s upcoming visit the Montreal Children’s Hospital, to hand out Halloween treats to the young patients who are unable to leave the hospital. McNicoll, a native of Boucherville, Que., made his debut with the Redmen a year ago after three seasons at the professional level in the American Hockey League and the East Coast Hockey League, which followed a stellar junior career that saw him average over one point per game in the QMJHL. The 5-foot-10, 174-pound centre excelled in his first season with McGill earning OUA all-conference honours and finishing second on the team in scoring with 15-25-35 in only 23 contests. He then claimed the OUA playoff scoring title with 16 points in eight games and guided the Redmen to an appearance in the University Cup national tournament. In the community, he has volunteered for numerous school and hospital visits during his time in the QMJHL, the ECHL and AHL.